How Did I Get Here, con’t. The Holy Spirit had to continue to remind me that my true purpose is ministry, which was birthed through Order Your Steps. I had to be mindful of the task at hand and allow the Lord to lead and guide me along the way. As the months went by, I could hear the Lord’s whispers in many different ways. One of our church Elders and my very dear friend would send me the Spirit of Prophecy bulletins for my daily devotional. It still never fails to hit me exactly where I am in that moment and on March 21, 2018, it was no different. Unfortunately, when things don’t go as I plan (as God laughs) I want to change the plan. However, when we’re in the midst of a spiritual journey, the rules change. The Lord will ask us to do things that are a tad uncomfortable, while we wait until He tells us to take the next step. He takes us out of the realm of reasoning and into the spiritual realm of faith. It is now, March and I’m in this most interesting God Set-up and I’m struggling. So, I tried to encourage myself by speaking positive words into my life. Every day, my journey will only get better. I’m living my best life! Positive speaking worked for a while, but I was having an Abraham moment! I just didn’t know how God was going to handle this for me. In Genesis 22, we are told that out of obedience to God, Abraham took Isaac, his only son, up one of the mountains in Moriah to offer him as a burnt offering. Now I know that my workshop assignment doesn’t come close to sacrificing my only son, but work with me. Abraham went up the mountain, knowing that the Lord had a plan, but he had no clue as to what would be the outcome, except that they (he and Isaac) would be going back down the mountain, but Abraham did not know how. Although I knew that the Lord has given me an assignment to accomplish, my Faith had begun to wain because I didn’t see the ram. I could see the answer that God had prepared for me even before He had given me the task or idea. I could tell you of many situations, when I thought that there may be a ram hidden in the thicket, but to be honest, I really wasn’t sure. I knew that God had always come through, but because of what I saw; doubt and uncertainty reared their ugly heads! Although Abraham didn’t see the ram at first, we know that the ram was on the mountain before Abraham and Isaac even got there. In faith, we must see the ram, to see God’s answer, even before we see it, I knew that I was going to see this assignment through and even if the Lord didn’t appear until my 11th hour, I knew that the ram was already in the bush! Later in January, the Lord impressed upon me to host an Order Your Steps event, a women’s workshop focusing primarily on helping them to establish more Order for their lives! I’d always conducted workshop for small groups on the organizing process, but I’d always driven solo. This time I’d have people speaking with me. So what began as a fall season event with a “New Beginning” theme, evolved into a Mother’s day weekend event, which in my opinion may not have been the best time? Usually, Mother’s day is a very, very busy period for mothers and families, so most women would not be available for a workshop. But the Lord was ordering my steps, so by no surprise, as I lined up the venue, vendors & even the speakers, everything seemed to fall into place. My workshop now entitled “Ordering My Steps: A Mother’s Perspective” was off and running!! So, I knew that whatever happened from that point forward, I’ve had to see it through, but, I also knew that it was not going be easy! From my previous experiences, God doesn’t normally give you something to do, if you can do it without Him. Now, we’re moving forward! The invitations were sent, we marketed on social media and life is good! Five tickets sell, Yayy!! Then a whole another month goes by and not one ticket sold. What do I do now? Shortly thereafter, I woke up one morning and the Lord said, “Plant the Seed”, and so I searched the scriptures and the Holy Spirit took me to Zechariah 8:11-13. Did I really hear God? 2019 has just began and it’s time to Organize your Mind, your Body and your Space! We would like to suggest that we think of organizing as a time “to plan and take action.” This is the best time to start new habits, to begin a new less hectic pace for our lives and possibly, a new way of thinking! We should organize our mind & body for a healthier lifestyle and plan to be more productive and more efficient in all aspects of our lives. Then we should take time to organize key areas of our homes, so that we know what we have, where we have it and be able to put our hand on it, when we need it. We pray that this year, we will continue to seek those opportunities to operate in our passion, use the talents and gifts that the Lord have given us and fulfill His purpose for us. Take a moment to reflect on the year that has passed. Focus on our positive accomplishments and don’t dwell on the negative. It is very difficult to build for BIGGER without a foundation. Let’s make sure we have an action plan with our goals & objectives for at least the next few months. We have to know where we’ve been, where we are going and …how we’re going to get there! This book will allow me to share how my steps have been ordered for more than 40 years, but my journey has only just begun. Please pray for me as I embark on this new adventure! The Holy Spirit reminded me that my true purpose is MINISTRY, which was birthed through Order Your Steps in September of 2011! I had to be mindful of the task at hand and allow the Lord to lead and guide me along the way. March 21, 2018: Beloved, I want to help you see and hear spiritual truth. To do this you must look without fear, prejudice, or expectation. You cannot allow anything to color or distort what I show you, but rather take it at face value. When you see something do not add anything to it or take anything away from it. Look with eyes wide open, ears ready to hear, and a heart ready to receive, says the Lord. Strive to be the BEST YOU, you can be! Since starting Order Your Steps, 6 years ago, I’ve been blessed that I have not had any major mishaps, i.e. “breaking stuff”! 😦 However, in spite of the recent mishaps, the clients had been very understanding, but the endless loop of thoughts in my mind had really been wearing on me. I am sure that this never happens to you… when those inner voices make us 2nd-quess who we are and our abilities! Now, the Lord did clarify for me that my gift is organizing, NOT moving stuff!! But I’m learning, although it’s difficult, to accept my humanity. As I’ve shared many, many times, I really don’t like to make mistakes, and yes, even “constructive criticism” is a bit painful. But I’m learning to store it away for now, since I’m sure that it will be very useful in the future. “Own who you are … I will finish what I’ve started in you! I had a friend to ask me “when will I get to easy street? You know, when I’ll have all the answers”… I told her that when you think you have reached easy street, there is another road “up the way”! Wait in Anticipation and Expectation, NOT in Frustration! Have you ever been frustrated with God? You know really frustrated, as it is defined: Feeling annoyed, especially because of inability to change or achieve something. Our destiny has been predetermined. 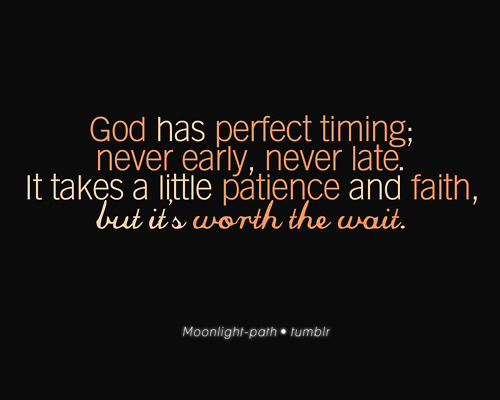 So the next time, we get frustrated with God, just remember, it’s all about His divine timing. It’s not that He doesn’t want to change our situation, it’s just not time… which means that we must WAIT! No! WAITING is not our most favorite thing to do (understatement!). However, when we are certain that our situation is gonna change, but we just don’t know when, that’s called FAITH!… and we should be EXCITED! Therefore, we should always wait in anticipation & expectation, NOT in frustration!!!!!!!!!!!!!!!!!! I know it’s a lot easier said, than done, but let’s keep practicing. 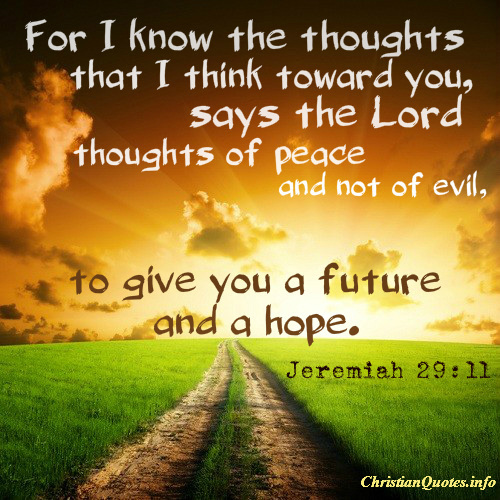 Saith the Lord …. to give you an expected end. Most of you know that my car was stolen and since then, a million and one thoughts have been swirling around in my head. After much anxiety, I was reassured that the Lord had allowed it to happen. Initially, because my purse & computer was NOT in the car, but then, what if the thief had come into the house? Then guilt & shame have their time to weigh in… “How could I have been so stupid?” I’d been warned that my area had been targeted by car theives, but surely I was exempt…. NOT! Then doubt and condemnation had their turn… “We can’t afford a new car!”, ” Maybe I am just not managing the money the way the Lord wants me too.” “If I have to buy a car, what about my credit? I haven’t even looked at a credit report since we moved into the house 11 years ago!” Then finally when I thought that God had simply given up on me, He reveals himself to me. I strongly suggest that we be very mindful of the seemingly small things. Well, I had to rent a car, although, business had been relatively slow. Soooooo, why not work a week and take off a week? Look at how much money I’ll save. Brilliant! Lo and behold, my insurance claim agent was AWESOME! He walked me through the process almost seamlessly. He tells me that the insurance company can make an offer for my car 3 weeks after the theft. Really Lord?? Not 60 days, not even 30 days! The claim agent promptly sent me the offer (it is about what I expected and it will cover a lot of car payments) and I pick up my check tomorrow. Look at God! In the interim, I’ve been car shopping on-line. Although I really like driving a car, with my company, I need to be able to do some light hauling. I was looking at the RAV4, because it’s sporty, but I didn’t know that it was a 4-cylinder 😦 ?? My husband suggested the Ford Edge. It’s a 6-cylinder, but it’s not very sporty looking and probably has more hauling space than I need. My husband adds that, “You think that it has more space than you need. You really don’t know what God has in store for you.” But get this… the most responsive dealership has been the Ford dealer. AND GET THIS THIS!!! They brought the car to my house and demo’d it in my driveway. It drove really smooth and they even offered to let me keep it overnight! I am certain that what the Devil meant for evil, God has turned it around for my good. I pick up my new car tonight! Business is getting busy and my calendar is almost full for the next three (3) weeks. Coincidence?… I think NOT! All things are going according to God’s plan. I’ve tried to figure HIM out, but it just makes my brain hurt. I’ve decided that it’s best that I not see my future, cuz I’d be like Daniel. When God showed him the future, he fainted 3 times….. Lord, just continue to Order My Steps!